The City and Miami Beach Chamber of Commerce are collaborating on a new Community Recovery Program that will address the immediate community needs following Hurricane Irma, including the establishment of two donation drop-off points, as well as short-term and long-term recovery and resilience. 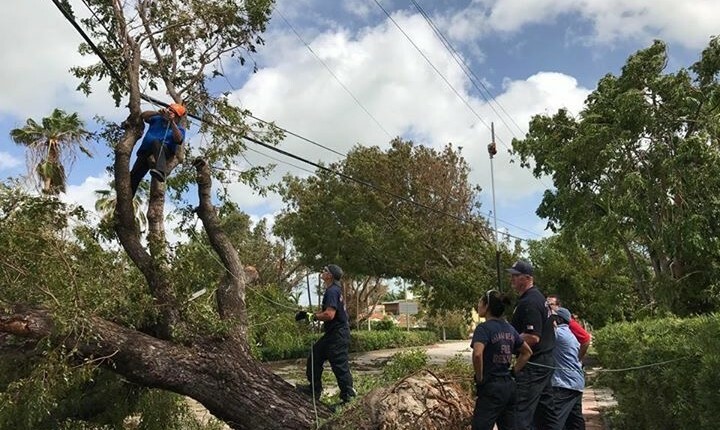 “Impacts from disaster can exacerbate additional community health and resiliency issues that may have been brewing under the surface,” City Manager Jimmy Morales wrote in a Letter to Commission. The new program augments existing services and programs with Community Recovery Centers (CRCs), and specialized staff, and includes an ongoing interface with FEMA. “This program is being implemented as the City recovers from Hurricane Irma, but the benefits are to be felt through long-term recovery, and components will be incorporated into the City’s Resiliency Strategy,” Morales said. Elements of the program include providing help for local businesses to recover from crises, community outreach and public education, and – to address immediate needs – volunteer and donation coordination. “I am proud that the City has elected to once again partner with the Miami Beach Chamber of Commerce to provide this valuable service to our community,” said Jerry Libbin, Chamber President and CEO. The City’s Department of Emergency Management and the Office of Housing and Community Services are working together to “identify, assess and prioritize needs for assistance, starting with our most vulnerable populations,” Morales wrote. Community health, mental health, and community outreach professionals are leading assessment and community response teams which are augmented in the short term by State and Federal resources where appropriate. To address the immediate needs, the City has set up two Community Recovery Centers to collect donations for those impacted by Irma and to address some of the other needs for assistance. “For the most part, the need for donations and volunteer assistance has been relatively minimal,” Morales wrote. “The outpouring of generosity, however, has been significant. As teams identify local needs, we are routing the donations to where they are most needed,” including areas impacted by both Hurricanes Harvey and Irma. The two recovery centers are located at 1627 Euclid Avenue and 7430 Collins Avenue and were donated for the Irma efforts by their owners, Mel Schlesser and Sandor Scher, respectively. In addition to collecting donations, the centers will also offer program disaster recovery assistance, some insurance clarification, information on available resources, and opportunities for volunteer sign-up efforts. Note: Clothing, shoes or perishable food will NOT be accepted. Hours of operation: 9 a.m. to 9 p.m., Monday through Saturday. The Community Recovery Centers will remain open at least through the first week in October, and may stay open longer, depending on the need. Above: Donations are starting to come in to the newly-opened Community Recovery Center at 1627 Euclid Avenue.